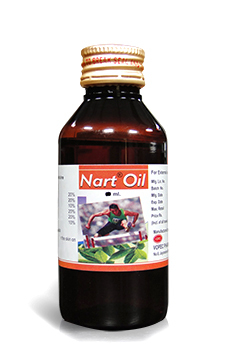 Nart Oil is prepared out of an excellent herbal combination which helps in relieving pain, toughness and inflammation of joints. It contains herbs possessing anti- inflammatory, immune modulatory and pain reducing properties. 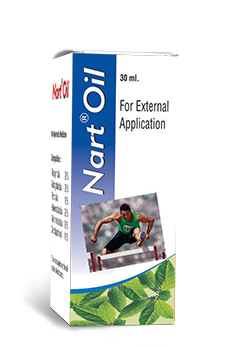 Nart oil increases the flexibility of joints and strengthens the bones and muscles surrounding the affected joints. Nart Oil penetrates deep into the joints when applied to affected areas and acts rapidly to relieve joint pain without any side effects. It renews and strengthens the elasticity of the cartilages in the joints and maintains the viscosity of the synovial fluid which is necessary for easy and painless mobility. Thereby it reduces bone friction and enhances joint flexibility and ease of movement. There have been no safety precautions identified during clinical testing. It is always prudent to consult a physician for additional clarification. Apply oil externally to the affected area when needed. For best results, use this product along with Nart Capsules. The liver overworks to correct detoxification of toxins and to manufacture proteins. Digestive system works harder to breakdown wastes and assimilate nutrients. Bio-chemistry of cells can become imbalanced. A sodium deficiency is an important long term background cause of bone and joint disorders. A deficiency leads to poor digestion and fermentation. This causes sodium to be drawn from the circulation to support the digestive system. Calcium is drawn from the bones to address this imbalance that cause weakness in its structure. This can make bones brittle. Why joint pain should not be ignored? A joint is where two bones meet to facilitate mobility. Bones not only allow movement, but also provide the basis for a solid, upright but flexible posture. Bones are attached to muscles, tendons and cartilage. This combination of parts is held together in a synovial membrane. In the cavity inside this membrane, synovial fluid is produced and held to lubricate the joint. If pain is experienced then we can assume there is impairment of any of these parts whereby one bone begins to come into contact with another bone directly causing discomfort. If ignored, mobility will suffer and pain will increase. Is joint pain and immobility reversible? Absolutely. Inflammation is a process that creates heat, redness, swelling, pain and loss of function. This causes pain and immobilisation. It is nature's way to stop the joint from moving so that healing can occur. Our products do not mask these symptoms, they assist by the removal of pain so that the healing can take place. Also, the correct nutrients present in the life force of the living material contained in our remedies address the imbalances in the blood, bones, organs and tissue fluids so that the pathogenic wastes can be removed quickly from the body and full function can be quickly normalised. Is there any toxicity concern shown in the study of Nart Oil? Some herbal chemicals can induce mutations and can also be responsible for future mutations. Mutations are responsible for abnormal cell growth that could lead to toxicity and cancer. 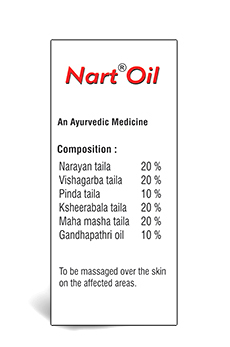 To test that there is no such effect, Nart Oil has been subjected to comprehensive research study. Using analysis known as 'bacterial reverse mutation' method, Nart Oil has been tested for mutagenicity, toxicity and carcinogenicity. The study showed that there was no significant finding for such toxicity.